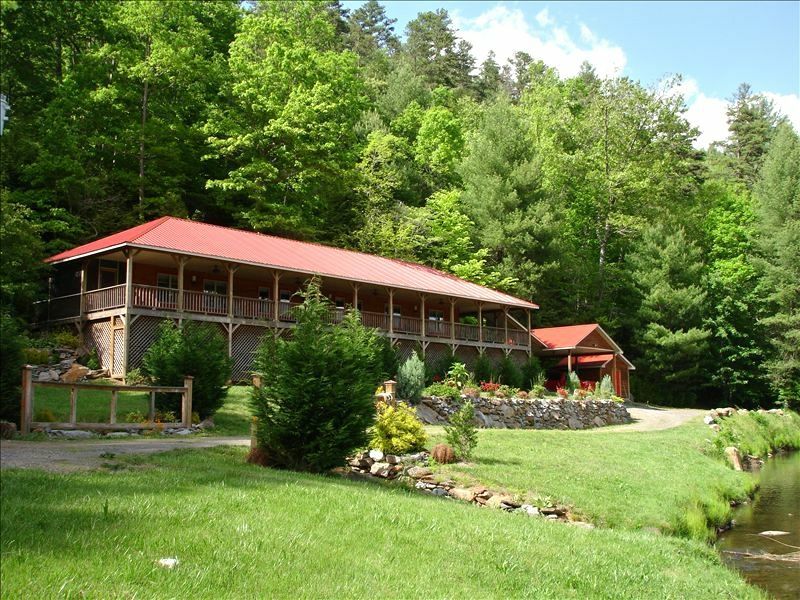 'LAST BEND LODGE' A PREMIUM WATERFRONT HOME IN THE WESTERN NORTH CAROLINA SMOKY MOUNTAINS. PLEASE SEE 'AVAILABILITY CALENDAR' BELOW FOR OPEN DATES. Last Bend Lodge, on the Scenic Banks of the Beautiful Nottely River, is so named because The Nottely performs a hairpin bend right in front of The Lodge, The Last Bend in the River before it disappears into the Vast Natahala National Forest! Several miles downstream The River flows into huge, pristine Lake Hiawassee which has over 150 miles of shoreline, 90% of which is unspoiled National Forest Land... Open to ALL! The Lodge is situated at 1500 feet elevation and within the area are peaks in excess of 5000 feet. The River sweeps up from the Southwest, executes its turn in front of The Lodge and bubbles off to the Southeast. The view from the massive, elevated deck is just spectacular. Last Bend Lodge was constructed in 2003 and is bordered by The River in front and The National Forest and our other home, River's Edge Cabin, on the other sides. Rushing Branch Creek tumbles down the mountain and into The River between the two Homes. The Master Suite features French Doors which open to a private, screened section of the deck overlooking The Creek. Yes, this is a private, secluded and very unique site and yet it is easily accessible, with no steep or precipitous driving, and not at all remote. Convenient Access and Excellent Privacy... The Best of Both Worlds! We are located in Cherokee County, North Carolina (The Westernmost County in the State) about seven miles west of the Bustling Mountain Town of Murphy, North Carolina which is also the County Seat. Murphy has a Junior College, a substantial Medical Center and a Regional-size Wal-Mart as well as many other dining and shopping options. The World Renowned John C. Campbell School of Folk Arts is a must see. They welcome you to walk right into the classes which range from Blacksmithing to Blue Grass Music. Come to Last Bend Lodge. Always peaceful and quiet of urban noise. Cool in the Spring and Summer, when the birds are singing and the fish are jumping and snug in the Fall and Winter, when the hills and valleys are ablaze with color and the peaks are capped snow white. Hike, bike, fish, antique, sightsee, and all of the other many activities... Or just sit on the porch and listen to The River Flow By. *Pets are welcome for a $50 per pet fee. There is also a $50 per pet extra (refundable with no damage) security deposit. We offer a professionally constructed, covered & lockable kennel. *Last Bend Lodge is 'Smoke Free'. You may smoke on the porch but absolutely not inside. We live in Austin, TX so Marie Speigel, our property manager, lives across the river and will be available to answer any questions you may have while enjoying Last Bend Lodge. We live in Austin, Texas and purchased this mountain retreat so that our children could spend more time enjoying their grandparents who live in Murphy, North Carolina. We have had many wonderful summers in the mountains and are happy to share this with others! Great property. Very picturesque location. Well maintained and equipped. Loved the rushing stream just outside of the master suite. We are so happy you all had a great time! Hope you will come back soon! Unbelievable tranquility! 4 days of the most peaceful time ever spent. Home was equipped with everything needed except for rocking chairs on the porch for watching the river run for old guys like me but the chaise lounges work just fine. Spent hours each night around the fantastic fire pit with family enjoying each other with the gentle music of the creek emptying into the river for our Pandora! Board games and puzzles abound. Hiking along the river bank or up the mountain behind kept the younger ones busy. Didn’t bother seeing any of the sites recommended just R & R at the Lodge. Definitely going back in warmer weather to play in the river. I rent twice a year 1 at the beach in the summer and 1 in the mountains in the Fall and this one is as AWESOME as it gets for stress relief! Thank you so much for sharing your part of paradise with me and my family. I loved this riverfront home. Two nights were not nearly enough. We had a lovely week! The house was immaculate and the location perfect: right on the river with a second small stream going down the side. Our 7 and 3yo boys had a blast. Would highly recommend. Beautiful, cozy cabin with such a perfect layout for family fun and convenience. This riverfront cabin is gorgeous! It’s views of the river and mountains is spectacular. In addition, there’s a creek to the left of the property right next to the campfire which makes roasting marshmallows and cooking so much fun for the whole family. The sound of the creek is relaxing and fun for children to play in. Overall, this property is a true retreat. We are so happy you enjoyed our little retreat so much and hope your family comes back in the very near future! Blessings! We greatly enjoyed our recent stay at Last Bend while my wife participated in classes at the John C. Campbell Folk School. The facilities were wonderful, the view is incredible, and the town of Murphy, with surprisingly good restaurants, is only about 10-15 minutes away. The house is fully appointed and very well maintained, and the Nottely River is very scenic. The river is a dam-release waterway, and we actually caught trout in the mornings before the mist lifted -- not bad for July fly fishing! We hope to return again! So happy you and your family had such a lovely time! Hope to see you again soon! Blessings!